I have always liked sugar-free jellies, not necessarily because of the saved calories but just because I don’t like my jelly too sweet. 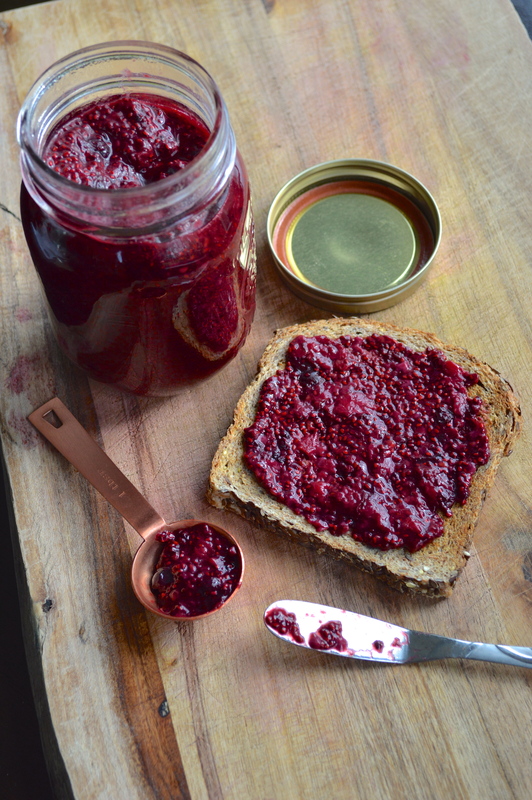 I saw a similar version to this chia jam on pinterest and decided why not make my own? Not only does this cut out anything unnecessary having just 3 ingredients (berries, truvia + chia) but it packs a powerhouse of nutrients. The berries are full of vitamins + antioxidants, the truvia is a natural way to sweeten things up and chia seeds hold a massive amount of nutrients (fiber, calcium, omega-3 fats, protein + vitamins) with very little calories. Basically, this is the perfect way to kickstart your day and it couldn’t be any easier to make! I like mine mixed in to some plain greek yogurt, in pre-workout smoothies + in steel cut oats but my favorite is on toasted Ezekial Flax Sprouted Whole Grain Bread. Start off by putting 1 lb of mixed berries into a saucepan over medium-high heat. I used frozen ones (blueberries, strawberries + raspberries) because it’s so easy and no prep, but you can also use fresh. Add in 4 packets of truvia (or more if you like it sweeter, you can also use pure maple syrup). As the berries start to heat up, they’ll soften and you can mash them up. I used a tool made for breaking up meat but you can use a potato masher or a fork. Leave a few chunks of berries for some texture but try to get it smooth for the most part. Once everything is “pureed”, let the fruit boil for a few minutes then stir in 1/4 cup chia seeds. Let boil while stirring for about 4 minutes, you’ll notice the chia seeds thickening everything up. Pour into a jar, seal it and store in the fridge! Start off by putting berries into a saucepan over medium-high heat. Add in truvia. 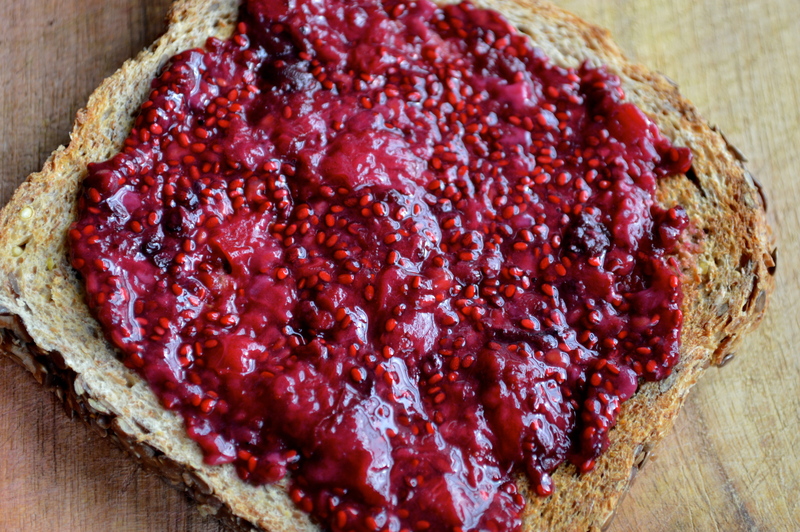 As the berries start to heat up, they’ll soften and you can mash them up. I used a tool made for breaking up meat but you can use a potato masher or a fork. Leave a few chunks of berries for some texture but try to get it smooth for the most part. 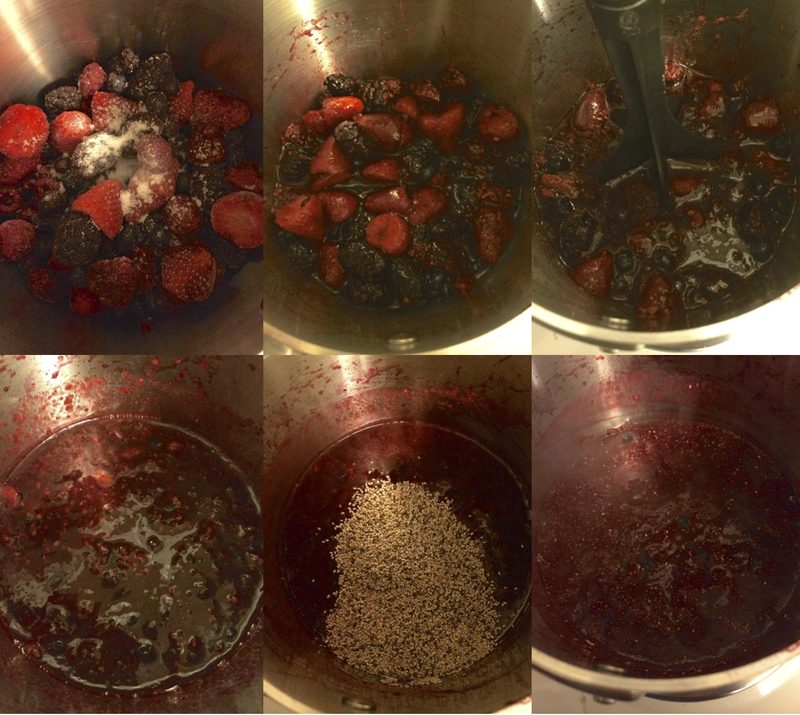 Once everything is “pureed”, let the fruit boil for a few minutes then stir in chia seeds. Let boil while stirring for about 4 minutes, you’ll notice the chia seeds thickening everything up. Pour into a jar, seal it and store in the fridge! Do the chia seeds dissolve? Or are those seeds in the pics chia seeds and berry seeds? Yes it’s SO easy and I actually had it in greek yogurt for breakfast this morning! You’re welcome, thanks for sharing it on your blog! A little off the # biscotti path but this blogger really has her priorities right! 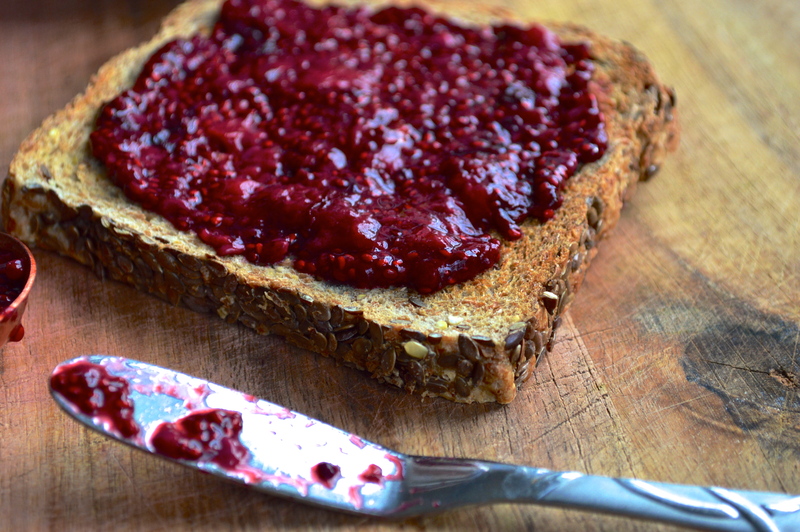 I would make this jam and add it into one of my berry biscotti recipes for a good punch of flavor. Looks delicious! Thanks so much for reblogging! Would love to hear if you decide to add it into a berry biscotti recipe!! Stay tuned….in the short term plans.